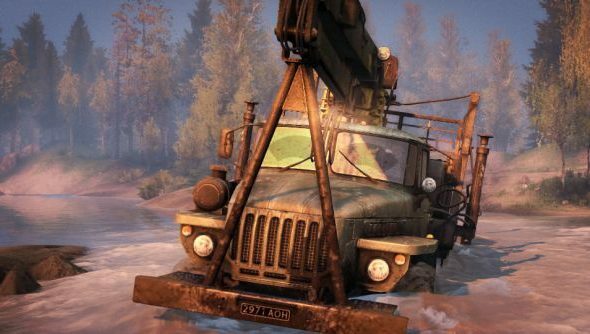 Update March 4, 2016: Spintires is now back on Steam. Oovee have issued an update on the Spintires Steam page to say that the game is now back on sale and should be working properly for all users, as well as apologising for the various problems. They also say they’ll have more information soon. Perhaps try one of the best racing games on PC instead? First, on the fix, you’ll need to shut down Steam and uninstall Localhost’s community-made update if you’ve been using it. Then start Steam again and the patch should apply. Once you run the game, the bottom left corner should have 03-03-2016 written out. “In the next few days we will release a full and frank statement regarding the cause of the problem and how we plan to avoid this happening again,” they explain in the post. There’s also going to be further details on what players can expect with regards to new content in the near future. Update 3 Mar, 2016:Talking toGamasutra, Spintires developer Pavel Zagrebelnyj claims any allegations regarding him sabotaging his own game with ‘time-bombs’ is untrue. Instead he states that buggy timer-based piracy checks are to blame for the crashing issues some players are suffering. “I don’t understand who and why started the rumours of sabotaging – apparently they are based on reverse engineering Spintires code?” said Zagrebelnyj in a statement. “Anyways, publisher (Oovee) have the source codes so they know (they should) I didn’t sabotage Spintires – there is no such code! Update 2 Mar, 2016:Spintires has been pulled from Steam.The pageis still visible, but you can no longer buy, add it to your wishlist or follow the game. This follows a communication breakdown between publisher and developer which culminated with the developer purposely sabotaging their own game. Original Story:It’s not often you see a developerdeliberatelysabotage their own game, but that seems to be the case here. Spintires has a long, sad history of conflict between original developerPavel Zagrebelnyj and publisher Oovee. The two have been alternately warring over the game and money owed while trying to keep it updated for hundreds of thousands of fans. Now it looks like Zagrebelnyj has disabled the game completely, with code timebombs that activated last week without an update and now cause it to crash regularly. It’s a long and horrendously complicated tale, but the upshot of it all is that Oovee are trying to get it fixed while the community has jerry-rigged their own. This thread on Reddit has two options, one that is an entirely unofficial and potentially dangerous (though somebody probably would have said by now if it was) dll, the other a program to trick the game into thinking the date is wrong, stopping the timebombs from activating. Meanwhile, Oovee say they’re hard at work on an official fix, but its been a week now. Whatever the problem is, it’s buried deep, and meanwhile the game is still on sale on Steam. There’s also way more of these timebombs in the game, as fix-creator Localhost has been reporting on the official forums. The v4 fix combats everything found so far, at least according to most reports, but Localhost calls finding problems and fixes “sweeping through a minefield with a microscope.” They’ve also discovered that these timebombs have been in place since at least the 4th of January.